Harry Potter Royal Mail 2018 Stamps 15 Stamp Presentation Pack New & Sealed. Includes 10 character stamps plus miniature sheet of 5 stamps. Royal Mail price £11.20. Dispatched with Royal Mail 1st Class postage. Card backed envelope to protect your stamps. Harry Potter (Pack No M16) Presentation pack 2007. Post Office Fresh. Less than face value. N.B. Does NOT include the Miniature sheet. HARRY POTTER 2017 MINI STAMPS M16. Dispatched with Royal Mail 1st Class Letter. I cant find the presentation pack they came in so sold as seen. 2018 Harry Potter Souvenir Pack ( All Characters ). 3156-57, 4141, 4143, 4145-47, 4149.
harry potter royal mailint stamps .new never opened. Dispatched with Royal Mail 2nd Class Letter. New listingHarry Potter (Pack No 562) Presentation pack 16.10.2018. Inc mini sheet.. Issued 16 October 2018. (INCLUDING MINIATURE SHEET). Triwizard Cup. MINIATURE SHEET. Format : Square 35mm x 35mm, Phosphor Bars. PVA Gum Mint Never Hinged. Mint Never Hinged. Full Set SG 4141 - SG 4150. Includes pictures of favourite characters Harry, Hermione, Ron, Hagrid, Ginny and Neville. Royal Mail Harry Potter Presentation Pack With Mini Sheet. Dispatched with Royal Mail 2nd Class Signed For. Brand new condition. Unwanted, unused. Any questions please ask. ::: UK Cover Lover :: Plus save at least 10% in our monthly sales. Regular Monthly Sale. Dedicated Support. GB Royal Mail Harry Potter Presentation Pack 2018 issue Includes Set of 10 first class Mint Stamps and a Self Adhesive minisheet consists of 5 first class stamps. Overall Excellent and clean condition. No faults. Any questions please ask. Released 16th October 2018. At face value ! From a clean smoke free household. 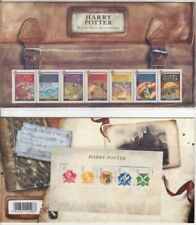 GB 2007 HARRY POTTER PRESENTATION PACK No M16 & MINIATURE SHEET SG 2750-2756 MS2757 MINT STAMP SET. Sorry No Checks Or Money Orders. UK:- 2nd Class Add £1.30. Harry Potter Souvenir Stamp Pack Ltd Collectors Edition, Postcard Character Card. Dispatched with Royal Mail Signed For® 1st Class Large Letter. Royal Mail Harry Potter Presentation Pack & Mini Sheet 16/10/18 - Brand New. Dispatched with Royal Mail 2nd Class Signed For. HARRY POTTER. 5 SCHOOL CRESTS - HOGWARTS. AND THE 4 SCHOOL HOUSES. Harry Potter Books & Symbols, 2007. Excellent condition. Harry Potter - Royal Mail Mint Stamps - Presentation Pack - 2018 Issue . Dispatched with Royal Mail 1st Class Letter. Harry Potter Souvenir Stamp Pack Ltd Collectors Edition. Contains Character Card, Postcard with Special Stamp Sets Affixed. Brand new in pack. Dispatched with Royal Mail 2nd Class Large Letter. Happy to answer any questions. Thanks for looking. CONDITION- Mint MNH - see scans. Issue date: 16th October 2018. The Harry Potter films are based on the hugely popular novels written by British author J.K. Rorling. Features a magical mixture of Harry Potter facts and imagery. Including pictures of favourite characters Harry, Hermione, Ron, Hagrid, Ginny and Neville. A STUNNING NEVER TO BE RELEASED AGAIN COLLECTORS ITEM FOR ANY HARRY POTTER FAN. GREAT HARRY POTTER, 2018 MINT SET OF 16 ROYAL MAIL POSTCARDS! Date of issue: 16th October 2018. Would make a great collectible gift for any Harry Potter fan or collector! Harry Potter (Pack No 562) Presentation pack 16.10.2018. Inc mini sheet..